Principle 1 - The tobacco industry produces and promotes a product that is addictive, cause disease and death and give rise to a range of social problems, including poverty. Thus, an incompatible conflict exists between the tobacco industry’s interests and public health policy interests. Principle 2 - Countries should be accountable and transparent when they deal with the tobacco industry, or representatives of its interests. Principle 3 - Countries should require the tobacco industry or its representatives to operate in a manner that is accountable and transparent. Principle 4 - Tobacco industry should not be granted incentives to establish or sustain their businesses as their products are lethal. Article 5.3 also state that any government branch (executive, legislative and judiciary) responsible for setting and implementing tobacco control policies and for protecting those policies against tobacco industry interests should be accountable for implementation of its implementation. The strategies and tactics used by the tobacco industry to interfere with the tobacco control activities. Where interactions are necessary, should be conducted transparently, and whenever possible, publicly. accept, support or endorse any voluntary code of conduct or instrument drafted by the tobacco industry that is offered as a substitute for legally enforceable tobacco control measures. accept, support or endorse any offer for assistance or proposed tobacco control legislation or policy drafted by or in collaboration with the tobacco industry. should have a code of conduct for public officials, prescribing the standards with which they should comply in their dealings with the tobacco industry. should not award contracts for carrying out any work related to setting and implementing public health policies with respect to tobacco control to candidates or tenderers who have conflicts of interest with established tobacco control policies. should develop clear policies that require public office holders who have or have had a role in setting and implementing public health policies with respect to tobacco control to inform their institutions about any intention to engage in an occupational activity within the tobacco industry, whether gainful or not, within a specified period of time after leaving service. should develop clear policies that require applicants for public office positions which have a role in setting and implementing public health policies with respect to tobacco control to declare any current or previous occupational activity with any tobacco industry whether gainful or not. should require government officials to declare and divest themselves of direct interests in the tobacco industry. state institutions should not have any financial interest in the tobacco industry, unless they are responsible for managing a State-owned tobacco industry. should not allow any person employed by the tobacco industry or any entity working to further its interests to be a member of any government body, committee or advisory group that sets or implements tobacco control or public health policy. should not nominate any person employed by the tobacco industry or any entity working to further its interests to serve on delegations to meetings of the Conference of the Parties, its subsidiary bodies or any other bodies established pursuant to decisions of the Conference of the Parties. should not allow any official or employee of government or of any semi/quasi-governmental body to accept payments, gifts or services, monetary or in-kind, from the tobacco industry. Governments should require that the information provided by the tobacco industry is transparent and accurate. Governments should denormalize and regulate purported “socially responsible” activities carried out by the tobacco industry, including but now limited to activities described as "corporate social responsibility"
The government should not give any preferential treatment to the tobacco industry. The State-owned tobacco industries should be treated in the same way as any other tobacco industry. To ensure the implementation of tobacco control policies, monitoring the implementation of Article 5.3 of the Convention in essential. This also involves tobacco industry monitoring. 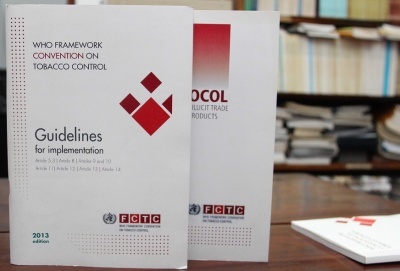 With the guidance of WHO, FCTC, tobacco observatories were established all over the world. Brazil is the first observatory and Sri Lanka the second in the world. Nongovernmental organizations and other members of civil society not affiliated with the tobacco industry could play an essential role in monitoring the activities of the tobacco industry. The tobacco observatory of Sri Lanka, Centre for Combating Tobacco (CCT) was initiated in 2016. Established at the Faculty of Medicine, University of Colombo, as of 2017, it is the only tobacco observatory in the WHO South East Asia Region.